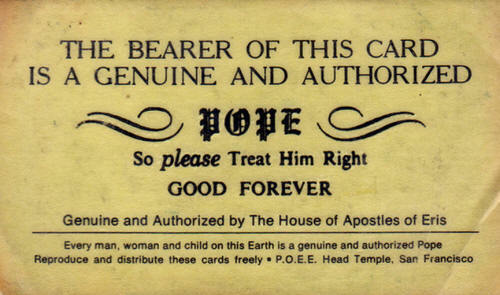 Folks, get those pledges in early and make sure you get your Papal name! 800-989-9368 or use the pledge box on the left to pledge online! Hi folks, thanks for being here. Anyone who pledges before 9pm will get a PAPAL NAME! Do you thing with the pledge box at top of page. MWAH!! I want to be Pope. hi monica! i want a papal name because i've already pledged to your show earlier! Can I be a Pope Emeritus without having to be Pope first? I'd like to skip right to the resignation. someone should make a remix of the pope praying. I'll pledge for an non-papal name. Something feminine, for sure. I wanna be a pope just for the fine fashions. I'm here but I am leaving :( Gotta take the kid to see OZ. Please bless me Mother Superior with my papal name and I shall check in later. I pledged earlier for the premium, girl! If you have any party favors leftover, please save me some. You teased us so good last week about these prizes. Brilliant email last night. Enjoy! It's gonna be a memorable show . . . I can feel it. T'Scott, it can be done...Will bless you later in show, Catsilk!...Uncle Michael, naughty dirty uncle!... Sister Eunice, Earrie?...Doca...think it's happened a coup;a times...CB2 - You rule already!! Monica turned me on to Eleni Mandell; if there are musicians/songs that you discovered on Monica's show, it's time to drop some coins into the WFMU collection box! And this is Monica's ONLY marathon show; you only have one chance to show her some love! Pledge now! What Mary said! Get a-pledging, everyone! This Cardinal just pledged and is ready to be Pope. That aura is ME! the uncle of a friend of mine only stopped drinking after he saw an angel. he says it was a real angel and not a hallucination. And where did you get that clip? Yeah, I need to see the rest of this clip. I never had any fantasies about His Holiness, but those shirtless guys are giving me ideas. is there any other kind of show on italian tv? Where'd the Pope get that dress? Is that Cristian Dior? The beanie's cute, too. snortley - it's fendi... mary wing in the house!....s'wolf, girl... CB1 - on Tumblr!...yo, G!! There are drops that come up from time to time on Ichiban that are *not* from this particular Sandy Pope recording. Drives me crazy...can't find it anywhere. wait... rooty-toots? rudy-poops? how do you spell that? I nearly bought a Mae West record last week. Russian state media - delivering memorable gifs since 1917. Monica, my child, thou art perhaps but a vessel - but WHADDA vessel!! ahh, rooty poot... kind of a yesteryear equivalent to "wack MC." thanks Uncle. oh man. i wanted to be pope daveus stiebus. vancouver is pope grow opus greatweed. Go Monica! Your premiums are always amazing! Just sent in my pledge for my Buttah. Would love a Pope Name, too. I take it that this isn't the same Martha Davis that fronted The Motels. You guys are awesome. Forgive me if I can't jump on comments as much as usual. Crazy here! Monica...did you wanna be Teri Hemmert when you grew up? You don't have to answer, just rattle your rock buttons. "make me chaste, lord. but not yet". - st augustine. I hope we get some calls in the phone room so we have something else to focus on, otherwise our eyes are all inextricably drawn to the horrifying gigantic plumber's crack that's been around there lately. AIIEEEE! Help us out with some pledges PLEASE! Wouldn't you like to be a Poper too? Somewhere my love. Lara's Theme. Wow, nearly 8K in 90 minutes? Monica is shakin' that moneymaker! So - it's swag-wearing week, to, huh? The hoodie w/ the yellow lettering goes well with weather this time of year. I pray that you meet your goal, Monica. fondest memory of Romper Room... Miss Jane (from Boston) used to say Good Morning Boyz and Gurls... I thought she was saying Good Morning Poison Squirrels!!!! I am going to spell it Pope Hilarious!! Declensions! I should have remembered that. Folks, we're in the home stretch and we're trying to reach the $10k goal for Monica's show! If you haven't pledged yet, NOW IS THE TIME! Papal names only available for 10 more minutes! 800-989-9368! How does one spell my Pope name? Glory be! Prayers have been answered!